As the judge rightly pointed out "the harm [Stardock] complains of is indeed its own making. [Stardock] had knowledge of Defendants' copyright claims from the outset." That pertains to the cause/effect of a DMCA process and has no bearing on the legal action itself. Also...anyone can put a '(c)' on a product box without actually OWNING the '(c)'. I strongly expect that printing process/result was just 'one of those things' that no-one cared to correct formally. Are you actually listening to the rabble rousing that you are doing here? It's so hyperbolic. Looking at it from a neutral standpoint, lets assume P&F win. Do they gain anything from the DMCA? No. They do not. Lets consider what happens if the DMCA was taken to court and P&F won, it would give large companies like EA the ability to take down any game they liked and cripple a company behind a wall of money that a small company would have no hope fighting. There is a lot of bad here that P&F tried to do that did not need to be done. People did not need to loose jobs from dev costs being cut to make up for the loss of sales. But the less core people will have lost jobs due to these unnecessary actions. The first company to overreach and go beyond just threatening and court cases was certainly P&F which puts them ethically in the wrong from where I stand. Large game publishers like Accolade in 1992 would certainly not allow anyone to slap a (c) copyright on a game that they published. Accolade had to approve the discs, box art, etc. The game discs and boxes were not printed in Fred's garage. 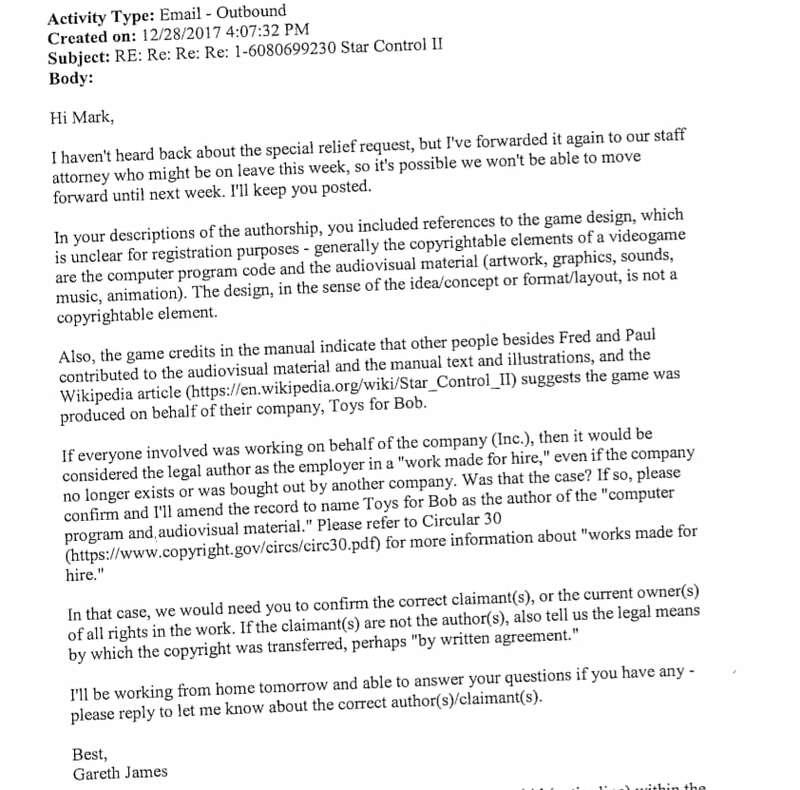 The e-mail thread with Atari is further evidence of Fred and Paul's ownership, in addition to the source code and everything else. And in any case, calling them "contractors on the classic DOS game" is disingenuous, misleading and an attempt to justify an unfair attack on them. Someone is ignoring our replies to post more of their own rhetoric. Please take part in a conversation rather than spam the same points, and yes, it is spam if you have nothing new to say. You're wasting your time. This forum is mostly full of people who are Stardock fans first and foremost. They have already decided that Stardock can do no wrong. Personally, I was looking forward to Origins and whatever P&F would come up with, but Stardock's actions have poisoned the waters so I have yet to (and may never) buy Origins. It's a pity, I was pretty neutral when the dispute started, not being a fan of Star Control from back in the day buy rather from playing UQM a couple of years ago. Uhhh, they directly addressed jafo's point about the copyright on the box. Your post sounds like you consider anything other than agreement to be ignoring people. However, Fred and Paul had no quarrel with Stardock making a game with NEW characters and content. That is exactly what happened here. A game with new characters and content. Anything that is actually in the game and is somehow perceived as *not* a new character for whatever reason definitely falls into "fair use" ("greys" are definitely fair use). I have sympathy for Paul and Fred. Now that lawyers are involved nothing is going to make sense. Hopefully there is a future that allows both SC:O and GotP to coexist. ozdon81, why does it matter if P&F have the copyright to SC2? Copyright protects source code and art. SCO has it's OWN source code and art. Trademark protects names, like McDonalds (company) or Big Mac (burger). Stardock owns the Star Control trademark because Atari made that cheap flash game called Star Control to extend the trademark, then Stardock bought the trademark. SCO did not copy source code or art from SC2. The ONLY grey area art-wise is hyperspace is similar. You could either believe P&F's chart or Stardock's point-by-point rebuttal chart. But if you want to ignore the spin and decide for yourself then you need to ignore the charts and look at the screenshots and see if you get confused which is from SC2 and which is from SCO. If you don't get confused then the "look and feel" is not similar enough. As to the aliens, Stardock can call the Precursors Precursors because P&F do not have the trademark to "Precursor" and it's too late for them to try to claim it now. Stardock have used "Precursor" in GalCiv for years, not to mention other franchises using "Precursor" before and after P&F. The only other infringement grey area is whether SCO is part of the multiverse with SC2, which might make the Precursors and the Observers in SCO the same as in SC2, which might infringe on the copyright. I guess Stardock wishes that is the case, but they were smart to not actually say that in game and to make the Observers NOT look the same as the Arilou. Prof_Hari_Seldon, I would prefer it if F&P hadn't found SCO infringing. That way both SCO and GotP could coexist (since I don't believe Stardock has a ghost of a chance of succeeding in convincing the court that F&P don't own the copyright to UQM). IANAL, of course, but that's what the facts point to as far as I can see.